The following conclusion of AR5 undoubtably had the most political impact. Humans cause global warming with 95% confidence thereby confirming that tough action is needed to enforce carbon targets in Europe and elsewhere. Skeptics have been proved wrong etc. Well now just 4 months later we have a new claim that the 17 year hiatus in warming has instead been caused by an increase in trade winds over the western pacific – part of the Pacific Decadel Oscillation (PDO). A Met Office report on the storms and flooding now affecting parts of the UK says that perturbations to the Jet stream has been driven in part by “persistent rainfall over Indonesia and the tropical West Pacific”. What they don’t point out though is that this explanation is totally at odds with the explanation given in the AR5 chapter 10 which defined the above attribution statement. Peter Stott of the Met Office was the lead author of this chapter. If explanations for the pause in warming can change so fast so that now PDO is the dominant effect then surely also the attribution statement needs itself to be revised. The observed recent warming hiatus, defined as the reduction in GMST trend during 1998–2012 as compared to the trend during 1951–2012, is attributable in roughly equal measure to a cooling contribution from internal variability and a reduced trend in external forcing (expert judgement, medium confidence).The forcing trend reduction is primarily due to a negative forcing trend from both volcanic eruptions and the downward phase of the solar cycle. However, there is low confidence in quantifying the role of forcing trend in causing the hiatus because of uncertainty in the magnitude of the volcanic forcing trends and low confidence in the aerosol forcing trend. 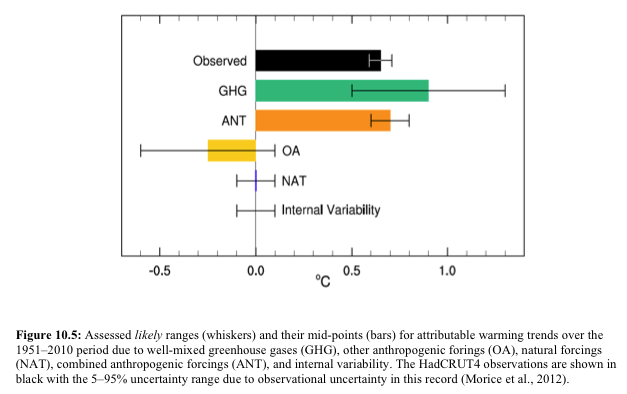 Many factors, in addition to GHGs, including changes in tropospheric and stratospheric aerosols, stratospheric water vapour, and solar output, as well as internal modes of variability, contribute to the year-to-year and decade- to-decade variability of GMST. The Atlantic Multi-decadal Oscillation (AMO) could be a confounding influence but studies that find a significant role for the AMO show that this does not project strongly onto 1951–2010 temperature trends. There is no mention at all of the PDO in this chapter. But suddenly just a few months later it is now the PDO that is responsible for the global warming hiatus and seemingly the Met Office is confirming this. If that is the case then the whole basis behind Fig 10.5 where both natural forcing and natural variation were reduced to just 0.0± 0.1C disappears. In addition the logic behind the SPM attribution statement must also need revisiting. This entry was posted in AGW, Climate Change, climate science, GCM, Science and tagged AGW, Climate Change, CO2, Met Office. Bookmark the permalink. … isn’t this something the public should know? This has been a standard trick in the AR’s for some time. Indeed, there is some “entertaining” discourse on (the abuses of) error bars and confidence limits in the Reviewers’ drafts of the AR4. At some points, the person responding on behalf of the IPCC (some think it was Jones) clearly does not have even the most basic understanding of “stats 101”, or they are lying through their teeth. … I wonder why they don’t point that out in their docs :-)? However, and while I don’t have proof for this, I have heard some (who are apparently in the know, but without citation) that the AR5’s “headline 95% confidence” was actually arrived at by “taking a vote/consensus” amongst some number of “card carrying” IPCC staff (e.g. gather 100 IPCC members and see how many raise their hand for “its man made”: answer, 95). If true, that is MUCH worse (scientifically speaking), since then there is not even the pretence of statistical analysis of the core issue. … and something CRUCIAL for the public to understand is that, in many ways, “science is the antithesis of democracy”. Anyone attempting to arrive at a scientific truth via consensus is likely “up to no good”, and are not (proper) scientists themselves. The ridiculous use of the Doran & Zimmerman “97.4%” number is clear example of such “slience” (“slimy science”). PS. I can’t remember the details, but back when the AR4 was being “forged” in the early 2000’s, oceanographers specialising in deep ocean cycles etc, were saying that temp histories (especially the sudden “warming” of the late 90’s etc), may well be due to deep ocean cycles bringing heat from the deep to the surface. The IPCC dismissed that out-of-hand. At least they did so when that theory was not supporting their (AG) claims. Now, they say the sudden recent cooling is deep ocean cycles … well, what a surprise … double standards by the IPCC. … if I remember the oceanographers’ names, I will post them. “science is the antithesis of democracy”. Anyone attempting to arrive at a scientific truth via consensus is likely “up to no good”, and are not (proper) scientists themselves. If you are right and the AR5?s “headline 95% confidence” was actually arrived at by “taking a vote/consensus” amongst some number of “card carrying” IPCC staff then that would be a total denial of science . It only takes one person to be right – Newton, Boltzmann, Einstein, Feynman etc. Watts and others are reporting a paper from seven years ago attributing the cessation of warming (lets not connive in the warmers abuse of language) to the slowing down of trade winds.